Finding the best spot carpet cleaner machines in a flooded market can be quite a tall order. However, there are a few brands and models that stand out from the rest with their quality features and impressive performance. Below are 3 such models and the features that put them among the greats. Powerful suction system – This ensures that as much dirty water as possible is suctioned up from the carpets, leaving them cleaner and dryer. Motorized brush with oscillating motion – The oscillating motion ensures that you clean out the dirt, grime and whatever other staining materials on all sides of the carpet fiber. This ensures fast and highly effective cleaning. Carpet friendly wheels – These make it super easy for you to roll the cleaner over the carpet to bring it to the spot you are cleaning. They also ensure that the fibers are left intact and undamaged while you maneuver. High capacity water and waste tanks – The two removable tanks can hold up to 64 oz. of liquid which is a lot for a spot cleaner. This makes it possible for you to spot clean your carpet up to 3 times without needing to empty or refill. 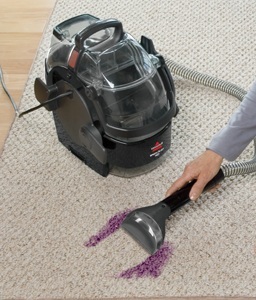 High motor power – According to Bissell, this is their most powerful spot cleaner. At 5.7 amps, the motor power here is just a tad below Bissell’s full-sized upright models. High capacity water tanks – The clean water and waste water tanks exists separately and can be removed from the unit for refilling and cleaning purposes respectively. The clean water tank in particular has a 96 oz. water capacity which is quite impressive for a spot carpet cleaner. 6 inch stair tool – The Bissell Spot Clean Pro package includes a wider 6 inch cleaning head that allows you to clean the stairs and bigger spots without missing a beat. It also allows easy access to areas that are otherwise very hard to get to. Flexible hose – The 5 foot hose is designed to make it easy for you to maneuver the cleaning head in order to reach hidden spots. This combined with the stair tool makes the model perfect for cleaning the carpet under furniture and at corners. Compact design and fairly light weight – The model doesn’t have wheels or a long handle. However, its compact design makes it easy to carry around and set-up for use. To make this possible, it also happens to have a power cord that is 22 feet long allowing you a wide range of movement for your spot carpet cleaning. 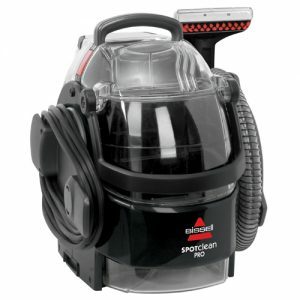 Compact design – Like the Bissell Spot Clean Pro, this model has no wheels and long handles. Users therefore get to enjoy the safe ease and convenience that comes with working with compact spot carpet cleaners. 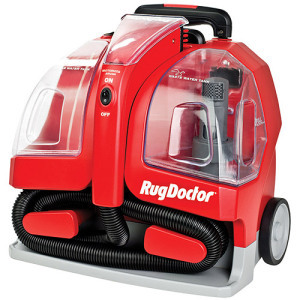 Powerful suction system – It functions using a basic spray and suction mechanisms. The sprays release the cleaning mixture at high pressure while the pump suction the water with the waste. PVC free tanks and hose – This feature makes the unit eco-friendly and safe for use on a long term basis. Tank capacity – It has a water tank capacity of 48 oz. allowing sufficient spot carpet cleaning most of the time. Built in water heater option – It’s sister version, the Little Green Proheat, comes with an internal water heater. This unit heats the cleaning solution on its way out through the sprays. Working with hot water allows the cleaning to be more effective in stains removal. However, internal heaters are not always desired because they complicate the machines. 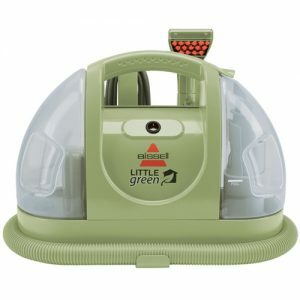 Related: For smaller sized handheld deep cleaners, check out our post What Are The Best Handheld Carpet Cleaners? After all is said and done, there is no denying the fact that these three spot carpet cleaners described above are worth the recognition. They will have your carpet clean enough to eat from in no time and with as little effort and hustle as possible.